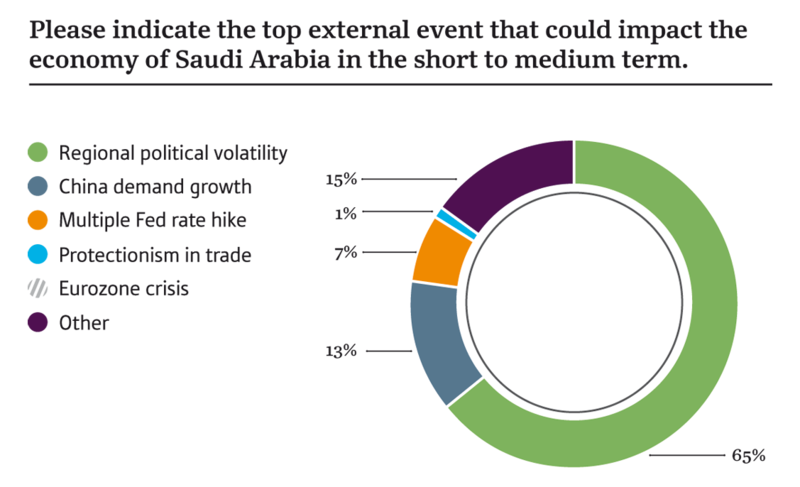 How do CEOs in Saudi Arabia view local conditions during times of global economic uncertainty? One might be forgiven for taking a look at global headlines in early 2019 and wanting to dive quickly beneath the covers. Indeed, the Western world has started the year exactly where it left off in 2018. The 35-day government shutdown in the US, the longest in the country’s history, highlighted the division and deadlock that Washington lawmakers are increasingly finding themselves in. Across the Atlantic Ocean to the UK, we find almost absolute symmetry, with Westminster in total paralysis over Brexit, and the country’s European neighbours – not to mention its business community – crying out for leaders to break through the impasse and avoid a no-deal scenario. Meanwhile, in France the gilets jaunes (yellow vests) movement has entered its 13th week, with the protests symptomatic of a political class seemingly unable to engage with the concerns of their electorates or to properly address the income inequality that has spiralled in the years since the 2008 global financial crisis. Is this to imply that the picture in emerging economies is better? Far from it, and indeed 2018 proved something of an annus horribilis for emerging markets. Falling growth rates in China, coupled with the ongoing trade war between the US and the world’s second-largest economy fuelled a general sense of malaise across the smaller economies. Meanwhile, multiple rate hikes by the US Federal Reserve on the back of a strengthening dollar sparked concerns of capital flight as investors looked for better yields in the US. A stronger greenback also puts further pressure on countries with large amounts of dollar-denominated debt – China being a case in point. Markets whose currencies are pegged to the dollar – such as Saudi Arabia’s – also face the prospect of a liquidity squeeze as a result of the US interest rate hikes, particularly in light of a tumbling oil price in the closing stages of 2018. Added to this were the two major emerging market currency crises that unfolded in Argentina and Turkey. So where does Saudi Arabia stand in all this? Reports indicate the Saudi government is forging ahead with spending despite the low oil prices. In December 2018 the government announced a 2019 budget of SR1.1trn ($293.3bn), the country’s biggest ever, which allocated SR200bn ($53.3bn) to the Private Sector Stimulus Plan over the medium term. Saudi Arabia will be included in the MSCI Emerging Markets Index for the first time in June 2019. While the index’s drop of 14.6% in 2018 was indicative of the year, it should also be noted that the fall came on the back of 37.3% growth in 2017 to reach a 15-year high. Indeed, 2018 was disappointing, but for understandable reasons, and there is optimism that the fortunes of emerging markets will fare better in 2019. This optimism is largely reflected in our 2019 Business Barometer: Saudi Arabia CEO Survey, with 64% of CEOs we spoke to indicating that they have positive or very positive expectations for local business conditions over the coming 12 months. Given that Saudi Arabia’s and the wider region’s integration into global supply chains over the past several years have left them more exposed to global headwinds, 65% of respondents cite regional political volatility as the event most likely to impact growth, followed by 13% identifying a slowdown in Chinese economic growth as their main concern. There is no denying that the winds of change that swept through Saudi Arabia in 2016 are still blowing strong. One thing that comes up again and again in our meetings with local businesspeople is the sense of renewed dynamism within the Kingdom, spurred by a large demographic of highly educated young nationals – 70% of the population in Saudi Arabia is under the age of 30. These young people are being reflected at the management level, too, with one CEO I recently spoke to emphasising the need to balance experience with the energy and innovation of the Kingdom’s young professionals. The younger generation is apparently underpinning boardroom confidence for the future, with 82% of the CEOs saying the Kingdom would be successful or very successful when it came to realising Vision 2030 goals. Change is visible outside the office, too. Sitting in my hotel lobby in Riyadh this week, I was amazed to see a family dismissing the hotel clerk’s request that they decamp to the family section, the matriarch insisting it was not necessary in the new Saudi Arabia. Perhaps this was a one-off, but the shift is certainly under way as evidenced by the lifting of bans on women driving and attending football matches in 2018. The loosening of restrictions also bodes well for the nascent entertainment industry, with cinemas opening in the Kingdom for the first time in 2018. A recent PwC report estimated that the cinema sector alone will contribute SR1bn ($266.6m) to GDP by 2020 and create 1000 direct jobs. Though Saudis spent around SR78bn ($20.8bn) on tourism abroad in 2017, the government is hopeful that by investing in big-ticket entertainment and leisure offerings, such as the Red Sea Project, nationals will redirect some of that spending into the country. 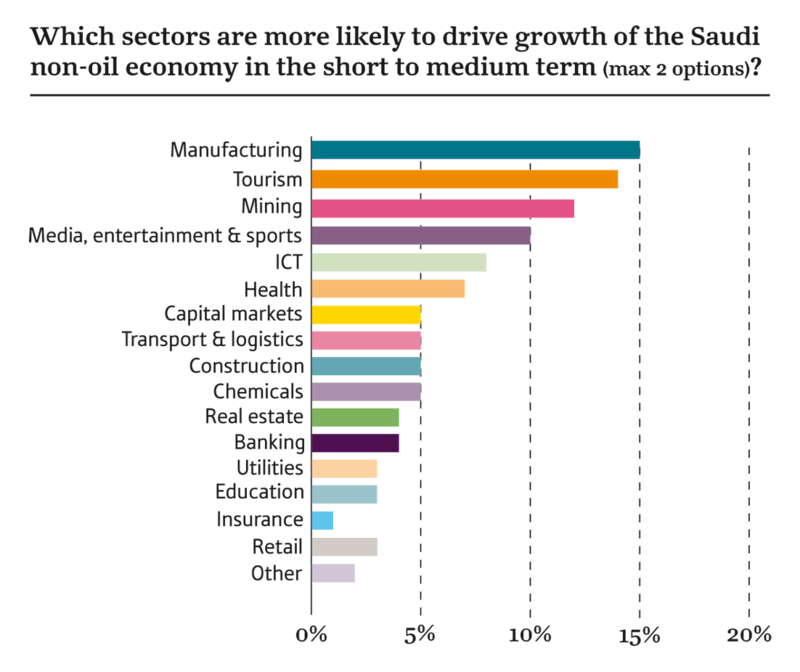 The local business community is upbeat about the government’s chances of success in this regard: 12% of total responses indicate that the tourism sector would be the biggest driver of non-oil growth in the medium term, second only to manufacturing (15%). Another major talking point in Saudi Arabia in 2018 was the introduction of value-added tax for the first time, with a majority of goods and services incurring a 5% levy from January 1, 2018. 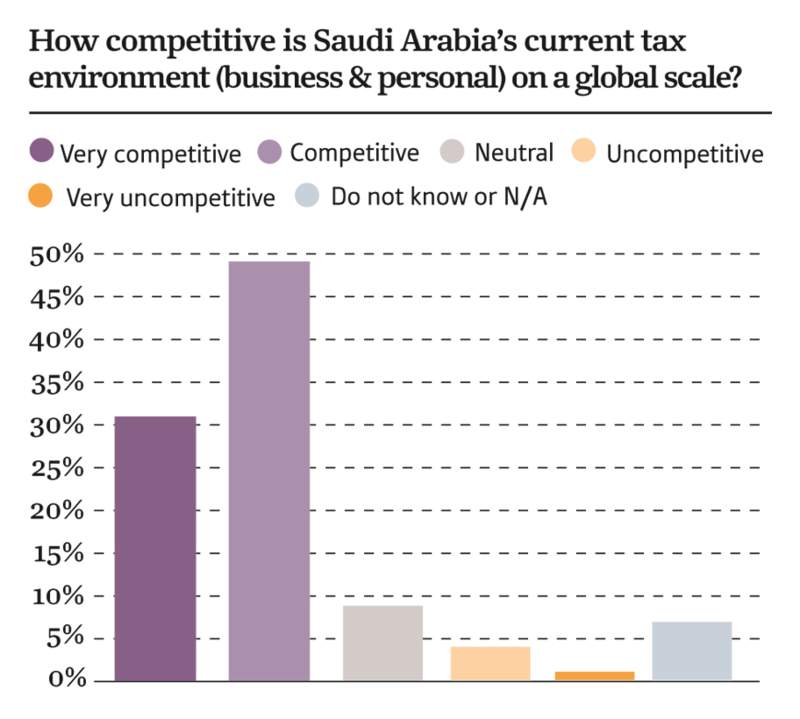 While the new tax was hardly expected to make a severe dent in the country’s fiscal competitiveness, it is nonetheless encouraging to see that 80% of CEOs still regard the Kingdom’s personal and business tax environments as competitive or very competitive, an outcome that can safely be interpreted as widespread acceptance among the business community of the need for limited taxation if the government is to curb reliance on hydrocarbons receipts. Tax revenue in 2018 was estimated at SR166bn ($44.3bn), up on the SR142bn ($37.9bn) originally budgeted.